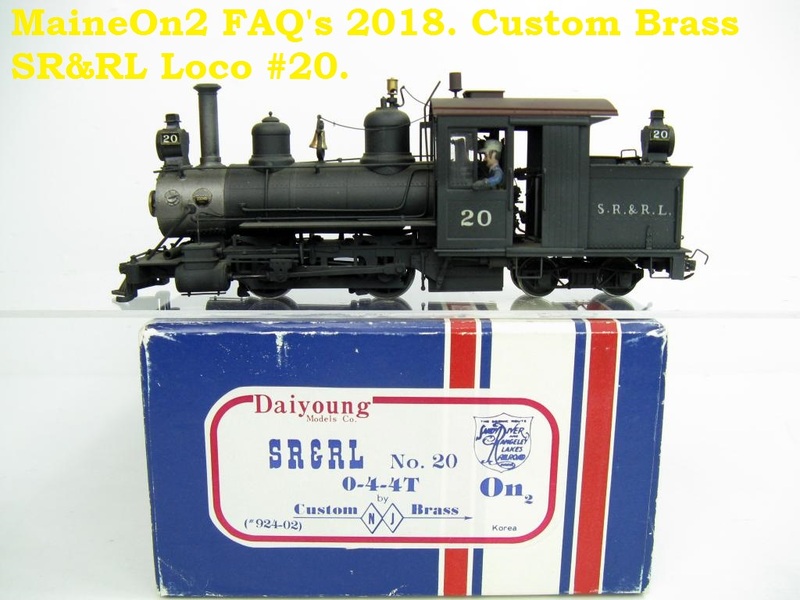 The notes on individual locomotives were originally collated and published by Chuck Collins, and are re-published here with his permission. The introduction, updates and formatting for this blog by Terry Smith. The Eustis Railroad was chartered in 1903 by the P&R and ran from a junction with the P&R at Eustis Junction some 15 or so miles to Berlin Mills and Skunk Brook Camp via Dago Junction. It was primarily a logging line to transport the forest to Boston as lumber and lumber products. The railroad and its locomotives were merged into the Sandy River and Rangeley Lakes Railroad company in January 1911, delayed by financial considerations and the company ceased to exist as a separate entity. 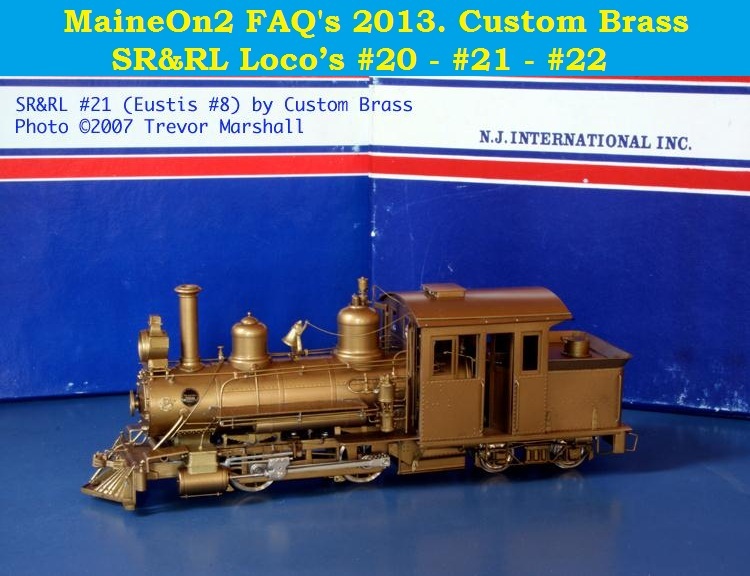 Baldwin #23245 built 11/1903 as Eustis #7. Rear tank held 800 gallons water & 1 ton coal. Sandy River & Rangeley Lakes #20 (1911 – 1936). 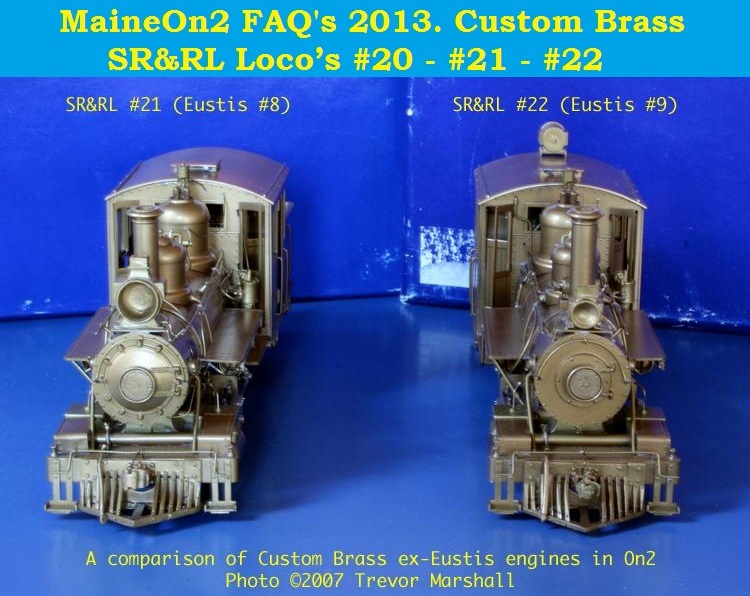 This engine was a modernized repetition of the design used for Phillips & Rangeley #2. It was the first of a three engine order purchased to pull trainloads of logs from the Eustis branch to the Berlin Mills sawmill at Madrid. Renumbered Sandy River & Rangeley Lakes #20 in August 1911. Fitted with air brakes in 1917. Fitted with electric headlight in 1919. Used as a standby engine until damaged in a wreck on 22 November 1922. Thereafter stored outdoors unrepaired and scrapped when the railroad was dismantled in 1935. Baldwin #23754 built 2/1904 as Eustis #8. Sandy River & Rangeley Lakes #21 (1911 – 1935). This engine was a modernized repetition of the design used for Phillips & Rangeley #2. It was the second of a three engine order purchased to pull trainloads of logs from the Eustis branch to the Berlin Mills sawmill at Madrid. Renumbered Sandy River & Rangeley Lakes #21 in August 1911. Fitted with air brakes in June 1917. Burned in the 3 October 1917 Rangeley engine house fire. Fitted with electric headlight in December 1920. Burned in the 12 February 1923 Phillips engine house fire. The heavy axle loading was destructive on 35 pound rails and discouraged use of this engine over the former Franklin & Megantic and Phillips & Rangeley after track maintenance was reduced during receivership. Used sparingly as a standby engine until it broke a driver axle in 1932. Scrapped when the railroad was dismantled in 1935. Baldwin #23755 built 2/1904 as Eustis #9. Sandy River & Rangeley Lakes #22 (1911 – 1935). This engine was a modernized repetition of the design used for Phillips & Rangeley #2. It was the third of a three engine order purchased to pull trainloads of logs from the Eustis branch to the Berlin Mills sawmill at Madrid. Renumbered Sandy River & Rangeley Lakes #22 in August 1911. Fitted with air brakes in 1917. Fitted with electric headlight in 1920. Struck an automobile near Rangeley on 17 September 1920 in the only documented grade crossing fatality of the Maine 2 foot gauge railroads. Burned in the 12 February 1923 Phillips enginehouse fire. The heavy axle loading was destructive on 35 pound rails and discouraged use of this engine over the former Franklin & Megantic and Phillips & Rangeley after track maintenance was reduced during receivership. Used sparingly as a standby engine. Stored outdoors at Phillips following abandonment of service to Rangeley. Scrapped in 1935. 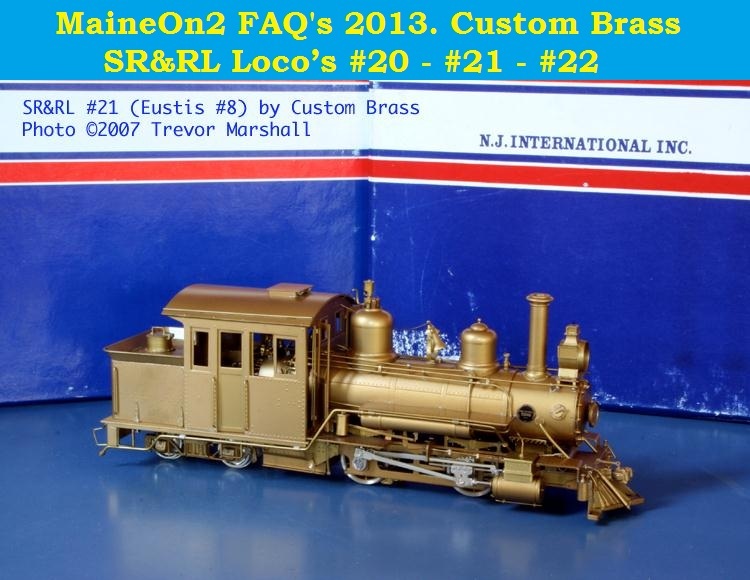 To view the SR&RL #20, #21 & #22 locomotive model pages, click here. 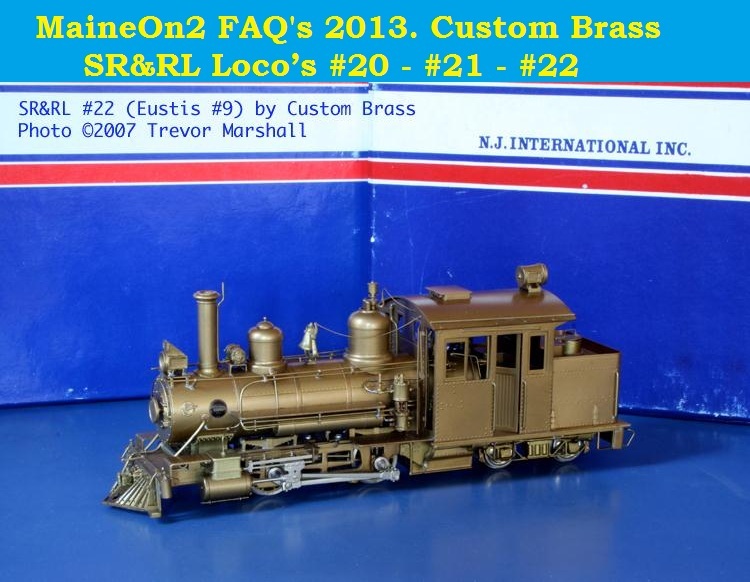 For more information about the prototype locomotives, visit the Chuck Collins pages. Click here to view on a new browser page. What are “the Maine Two Footers”? The former Monson locomotive #3, seen here at the Portland Narrow Gauge Museum in 1997 is a typical Maine Two Foot locomotive. The narrowness of two foot gauge track is evident at the feet of the onlookers. 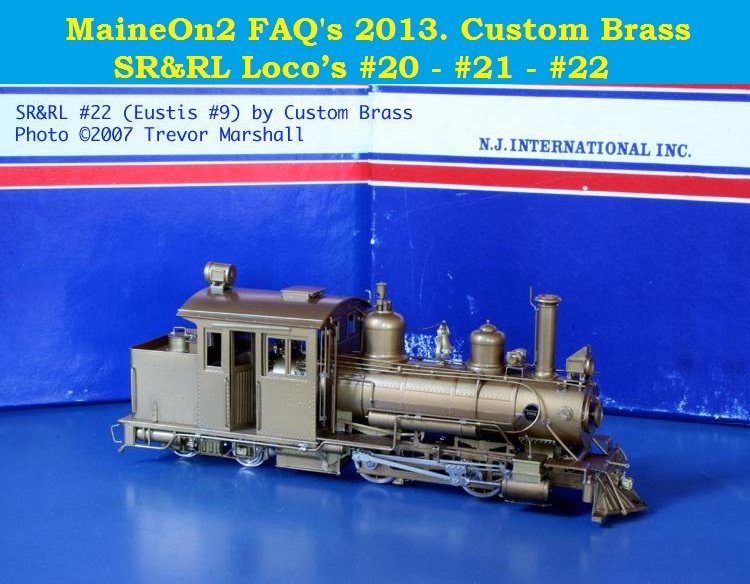 Most enthusiasts would recognise them as a group of two foot gauge railroads that were built in Maine from the 1880’s onwards, and operated as common carriers to their local communities until as late as the 1940’s. They were characterised by using the same locomotives designs, and the same suppliers for rolling stock initially, and later worked co-operatively to develop better and larger locomotives. A number of locomotives and coaches changed lines at various stages of their careers. SR&RL – Sandy River & Rangeley Lakes (formerly Sandy River, Franklin & Megantic, Phillips & Rangeley, Eustis) with two associated lines Madrid RR, Kingfield & Dead River RR which were both developed to handle lumber interest in the area, but never had equipment of their own. WW&F – Wiscasset Waterville and Farmington (formerly Wiscasset & Quebec). The first two foot gauge common carrier railroad built on the East Coast was the ill fated Billerica & Bedford railroad in Massachusetts which started the interest in two foot railroads but only operated for nine months, before the equipment was sold to the then building Sandy River Railroad. A lot of the equipment was to later return to Massachusetts when the remnants of the Bridgton and Harrison line and two Monson locomotives plus other various equipment were collected at South Carver to form the Edaville Railroad, which ran from 1947 until initial closure in 1993. 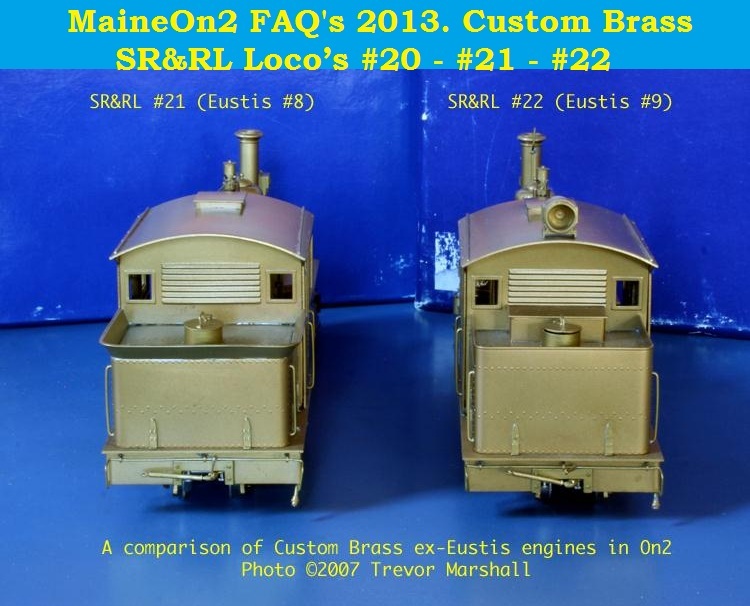 In line with most enthusiasts, this FAQ’s will use the term “the Maine Two Footers” to refer to and include all the above named lines. Further information on these lines can be obtained from a number of sources. 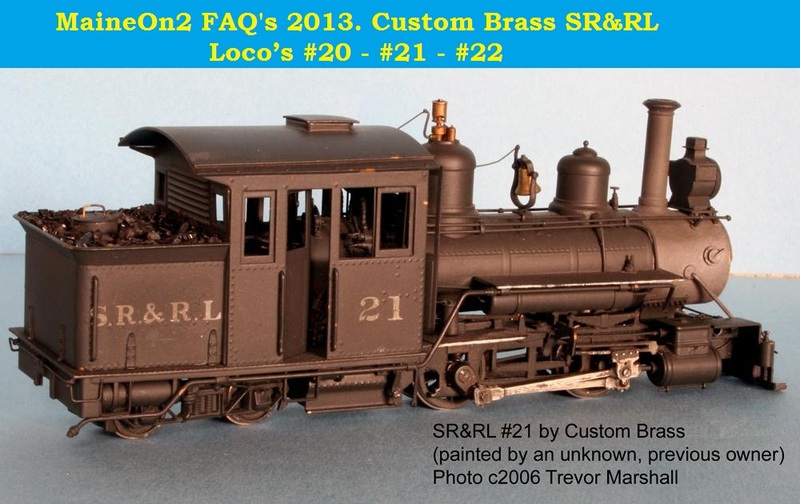 For more information about the B&SR locomotives click here. 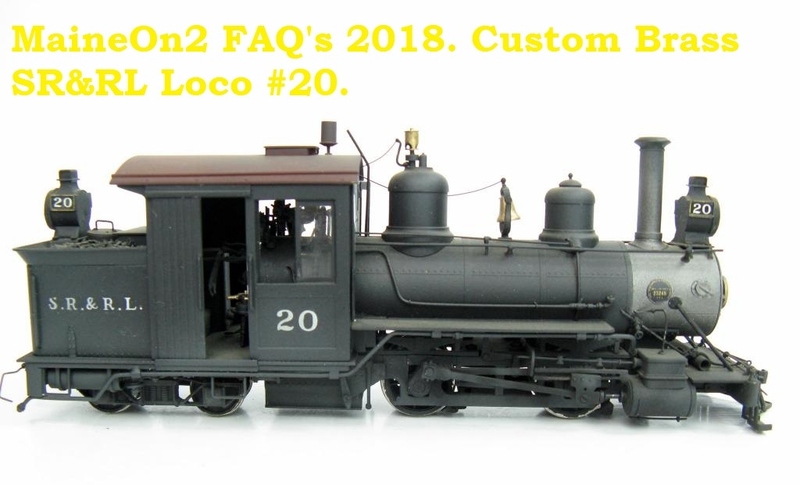 For more information about the KC locomotives click here. 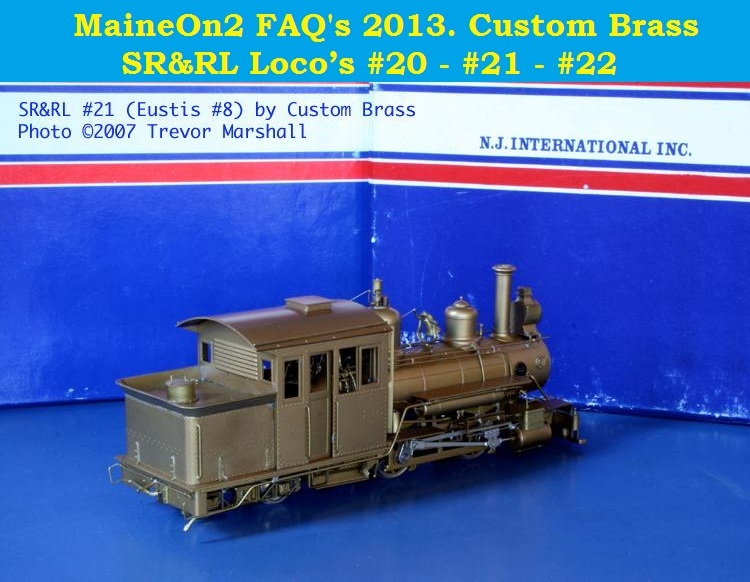 For more information about the Monson locomotives click here. 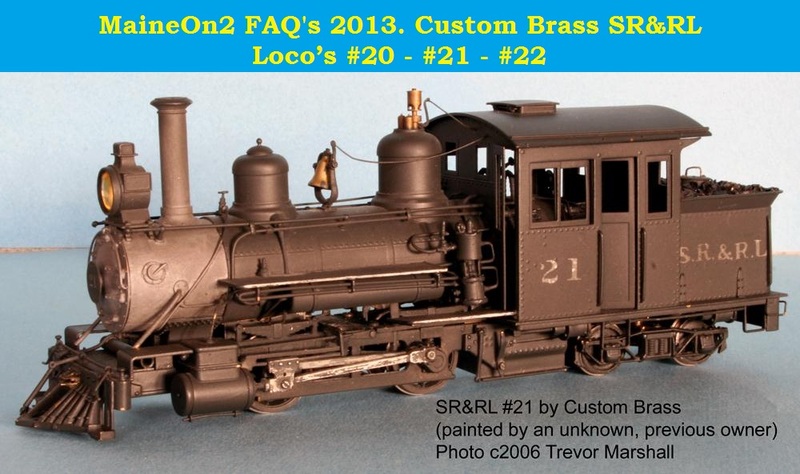 For more information about the SR&RL locomotives click here. For more information about the WW&F locomotives click here. Has a useful map showing the locations of all of the Maine Two Footers (click on image to enlarge in your browser). Some of the historical facts presented about the SR&RL are believed to be suspect. Written by Terry Smith 11-Aug-2013, updated 02-03-2015. This model generally requires a 38″ minimum radius for satisfactory operation. 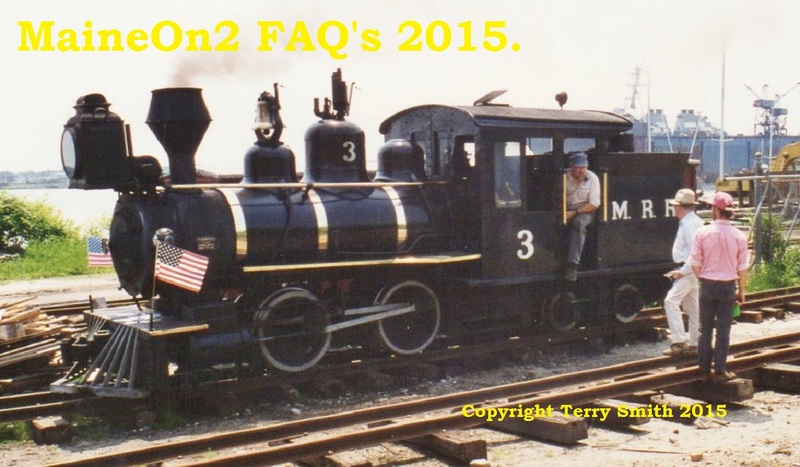 For more information about the prototype locomotives, visit the Chuck Collins pages. Click here to view the SR&RL information on another browser page, and here to view the Eustis information.